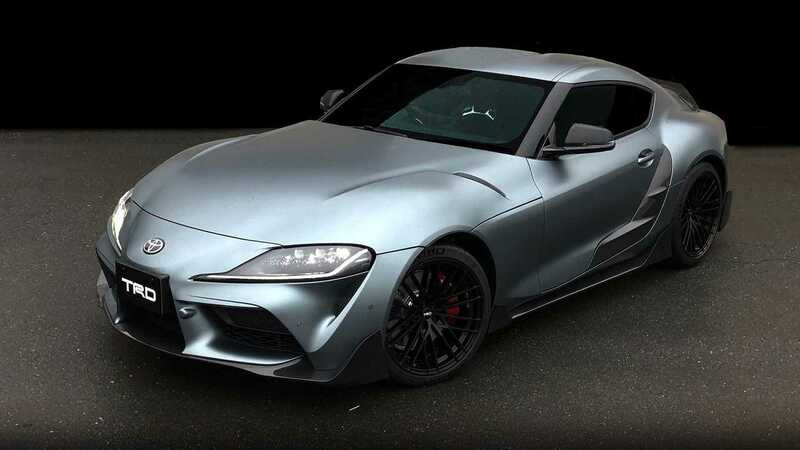 More than three weeks after the arrival of the A90 Supra and exactly three weeks after its first-production model was sold for $2.1 million at an auction, Toyota Racing Development debuts the GR Supra Performance Line Concept TRD. As promised in the teaser released last week, the new Supra TRD Concept was officially unveiled today at TRD Japan’s website. The timing for a TRD version of the sports coupe may seem soon for some, but it can never really be too early to amplify the legendary return of an icon. The new Supra TRD Concept provides future Supra owners a clear view of how they can upgrade their sports cars with TRD parts and kits. Engine upgrades aren’t included, though, so if that’s what you’re after, you won’t be seeing anything about it here. Nevertheless, even without the engine upgrades, it employs upgraded performance through real carbon fiber parts that are both light and strong. Up front, the TRD version of the fifth-generation Supra gets front spoilers with huge fins to increase downforce and reduce lift up during high-speed runs. The same goes with the side skirts, with the bonus of lowered center of gravity due to the low position of the skirts. The door garnish, on the other hand, isn’t just for added flair – it’s designed to mitigate airflow turbulence and employ a smoother airflow to the rear end. Lastly, the Toyota GR Supra Performance Line Concept TRD comes with a set of light 19-inch forged aluminum wheels with mesh spoke design. Of note, suspension and brake enhancements weren’t included in the unveiled concept, but on the bright side, the bottom of TRD Japan’s page says “To Be Continued” which could mean that there’s more to come for the Supra TRD.